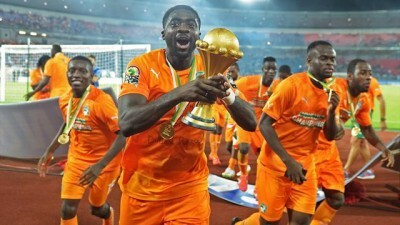 The reigning champions are back to kick off their title defence in Nigeria, but this is a very different Ivory Coast team to the one that clinched the Cup of Nations earlier this year. Wait, Nigeria? But the title says Sierra Leone. Yes, the Leone Stars are still in exile due to the Ebola outbreak and are playing their first home match of the campaign in the brand new 40,000-seater Adokiye Amiesimaka Stadium in Port Harcourt. Originally the game was scheduled for Lagos, but the Teslim Balogun Stadium’s artificial pitch was eventually deemed to be unsuitable just five days before kick-off. All of this shouldn’t really phase this Ivory Coast side, even if it is an inexperienced one shorn of some of its leading lights. There’s no Kolo or Yaya Toure. There’s no Max Gradel or Wilfried Bony. Cheick Tiote and Siaka Tiene are absent too, along with one of the discoveries of the 2015 Cup of Nations, centre-back Wilfried Kanon. And of course, Boubacar Barry isn’t there either. As a result, 22-year-old Serge Aurier is the most-capped defender in the squad, while Serey Die is the only midfielder in double figures in the caps column. The only real experience comes in the form of Salomon Kalou and Gervinho. All of this doesn’t give new coach Michel Dussuyer an awful lot to work with, but the former Guinea manager has a decent track record in getting the most out of average sides. And even then, we’re hardly talking about an average side – youth and inexperience doesn’t necessarily equal a lack of talent, and the young Ivorians are still mostly players from the stronger league in Europe. It was always going to be a transition phase for Les Elephants, with the great generation fading away now that it has finally won the Cup of Nations. Obviously Dussuyer isn’t just here to manage a decline – that would not be acceptable. But it is going to be hard to live up to the high expectations with a very different group of players. So much now rests on Seydou Doumbia, the mercurial CSKA Moscow striker who briefly retired from internationals after failing to be called up to the World Cup squad before returning under Herve Renard. He has scored just three goals for his country in 29 appearances, forever in the shadow of Drogba and more recently Bony. The Ivorians’ only game so far was a friendly against group guests Gabon which ended 0-0. But Sierra Leone have already had their first official match in the group, a narrow 1-0 defeat to Sudan in Khartoum courtesy of a late penalty. Ebola has put the skids on what was a rising nation in African football, capable of pushing some of the bigger names in their groups quite hard. They weren’t helped in the 2015 qualification process by drawing Ivory Coast, Cameroon and DR Congo; the only point they picked up was a “home” 0-0 draw to Cameroon in, of all places, Yaounde, as all of their home matches took place in the country of the “away” team. Their five defeats included 2-1 and 5-1 losses to their next opponents in Abidjan. The World Cup qualification draw hasn’t been particularly kind to the Leone Stars either, with the reward for a potential victory over two legs against minnows Chad being a tie against the giants of Egypt – it could have been worse, but it’s fair to say qualification for the tournament is extremely unlikely, even if matches soon return to Freetown. Their current squad is a mix of players who ply their trades in various European nations, albeit mostly minor ones, ranging from Cyprus to Sweden. The four British-based players include lower English league journeyman Mustapha Dumbuya, now at Partick Thistle in Scotland, Leicester City reserve Alie Sesay, and Samuel Bangura of Marlow, who play in the eighth tier of English football. But the best known player in the squad (due to the absence of Kei Kamara) is Mohamed “Medo” Kamara of Bolton Wanderers. The most capped player in the squad is Julius Wobay, currently without a club after being released by Neftchi Baku.